Got ask by user on how to change page layout to landscape in Open Office. After some testing, found the way to change page layout to landscape in Open Office. « How to clear print queue in Mac? Nevermind! I finally found it under Format>Page! I have OpenOffice 3 and what you suggest only works in the Spreadsheet part. How do you do this in the Text Document part? Choose File > Page Setup. 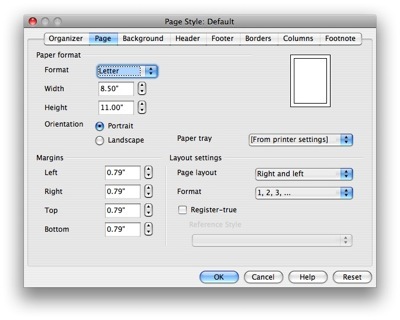 Choose Page Attributes from the Settings pop-up menu, and then choose Any Printer from the Format For pop-up menu. Choosing Any Printer ensures that your document can print on any printer that supports the paper size you select. If Page Setup is not available, choose File > Print. If the Print dialog contains only two pop-up menus and some buttons across the bottom, click the disclosure triangle beside the Printer pop-up menu. Click the Orientation button that matches the way you want your document to print. This also does not work since i haven’t typed up a page yet. I need to set the boundaries first so I can see if what i have will fit the page. Help! hi peter, preview with one or two page doesnt really matters. as long as it shows what you have set then it’s ok. I have OpenOffice 2.0. What are the details for LANDSCAPING. I don’t know if I’m doing this correctly. When I preview my page, I get two individual side by side pages. Is this correct? Or should the preview show ONE PAGE that has the two pages side by side within it?